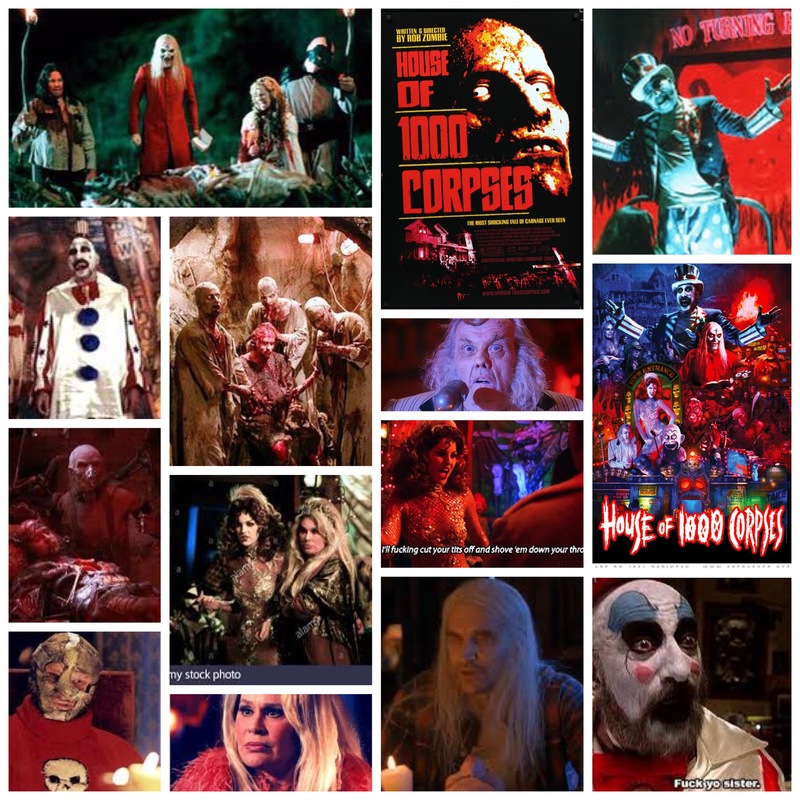 Rob Zombie’s House Of 1000 Corpses is a lot to sit through, and at times is a victim of its own overly zany ambition. Nevertheless, it’s the first stepping stone in the path of one of the most fascinating and talented directorial careers in the industry, and is a completely batshit mental curiosity in its own right. Zombie sprung onto the scene with this one and has since been a controversial, much talked about and frequently hated voice of horror. Let’s get one thing transparently clear: No one can be blamed for not enjoying his films, they’re incredibly niche and not everyone’s thing, but you are simply lying to yourself if you won’t concede what a hugely talented writer, director and all round filmmaker he is. I’ve had to get quite stern in conversations with people whose tunnel vision stubbornness supersedes their ability to logically analyze his work, and I simply won’t put up with it. Alright, scolding done, over to the film. I’ll be the first to admit that House is a splattered mess at times and goes about six light years over the top, but the sheer grungy scope of production design is really something to see. In deepest backwoods Americana, the murderous Firefly clan preys on, terrorizes and murders pretty much anyone who gets in their path. Bill Moseley is a Manson-esque dark angel as Otis Driftwood, renegade bad boy brother, Sheri Moon Zombie is like Harley Quinn on bath salts as Baby, who is definitely the scariest, while gargantuan Matthew McGrory, walking decrepitude grandpa (Dennis Fimple) and giggling slutwhore Mama (Karen Black doing her very best freaky Betty Boop rendition) round out the rest of the brood. They live in some cluttered rural dump right out of Hoarders™, luring unsuspecting travellers off the road and murdering them in really over elaborate, exhaustive looking ways. Oh and we see the birth of one of cinema’s most jovial and sleazy killer clowns, Sid Haig’s motor mouth Captain Spaulding, who bookends the film in uproariously raunchy comic relief. It’s a neon fever nightmare of relentless commotion, visual excess, metal music, retro Americana pop culture bliss and sadistic gore, Zombie going all out to solidify his storytelling aesthetic that would continue, in augmented, evolved ways, over the course of his brilliant career. This is certainly as obnoxious a film as you’ll find in his stable, and while it ranks in the southern end of my Zombie favourites list, there’s just no ignoring the raucous, depraved celebration of all things gross, gooey and grotesque that parades by. Not to mention the whip-smart, trashy and endlessly funny dialogue, writing being skill that the man excels in on another level.